We just came back from a two weeks trip to France and the highlight of this trip was the week long ski experience. Normally, we plan trips back to France during the children's vacation. For the last one year, the boy has been asking to go skiing. He reasoned that his sister first went skiing when she was four and at the age of six, he never had the privilege of going skiing. Being the doting mummy, more than nine months ago, around June 2015, I started looking at the possibility of going skiing during winter. I started checking out Japan and Korea first. The girl and I had a great time skiing in Yuzawa, Japan in 2013 during one of our girlie trips. I thought that Japan is closer to Singapore and therefore taking into consideration flights and all, it would probably be cheaper. Some of the shortlisted destination included club med Saporo or one of the ski resorts in Niseko. Low and behold, we came across a fantastic flight promotion to Europe on Lufthansa end of July and I thought, maybe we could go back for a holiday and spend a week skiing at the same time. The hubby needed little convincing and before I know it, the flights were booked for February 2016! And yes, we do plan our trips very early, usually three to six months in advance! Once the flight was booked, we went about shortlisting the resort. 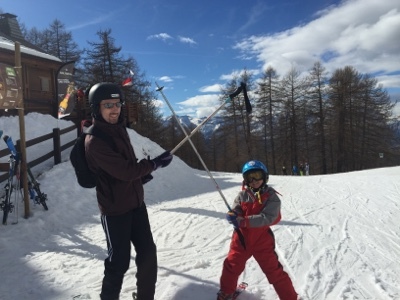 We hesitated between Isola 2000 and Valberg before eventually deciding on the latter as it was a small and more family friendly resort. As it was the boy's first ski experience, we thought that we should not overwhelm him. Once the resort was decided, we looked into accommodation and ski lessons. It was relatively simple to get those settled. Valberg has a great website for planning the trip. 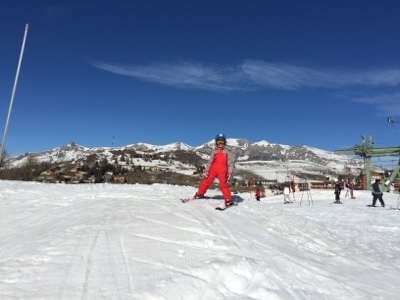 We decided on Chalet Suisse in Valberg as they had one of the best reviews but unfortunately, even though we tried to book in August, six months ahead of the trip, the hotel was full! We did manage to get one of the apartments that they owned as well. It turned out as great as the hotel since it was only 30m from the ski slopes (instead of barely 10m from the entrance of the hotel). It actually worked out better for us as we were able to cook in the apartment and had a private garden where the kids could build snowman and had some snowball fight. We also booked the kids with the ski school. We signed them up for daily lessons in the morning. And the kids took to skiing like fish in water! Before I know it, on the second day, the hubby was taking the girl down the red slopes while the boy was stuck with me on green and blues but on the fourth day, the boy went with them on the red!!! Yikes. The little ones were getting ahead of me! The boy on the second day with me, going on the green and blue. Eventually, on the last two days, I went for refresher lessons as well. Oh well. I better catch up with the kids. For the uninitiated, if you want to try skiing in the French Alps, I would totally recommend Valberg. You could navigate through all the reservations easily without speaking much French and it's easy to get to. You fly into Nice Airport in the south of France and there are direct bus transfer to Valberg for only EUR8 for a return journey! The bus can be reserved on Lignes d'azur. Accommodations can be booked with Chalet Suisse or on the Valberg Central Reservation site. 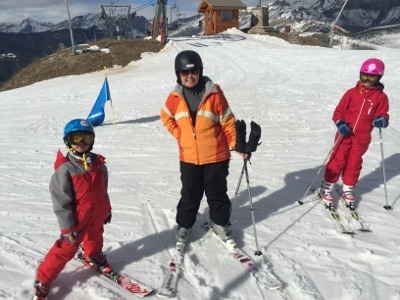 Ski lessons can be booked via ESF Valberg (French ski school). They do have some English speaking instructors too. And finally, ski equipments could be booked through numerous sports shop but we used Skiset. Do note that in France, ski clothes cannot be hired so do bring your own! And have lots of fun! The little ones cannot wait to go skiing again!